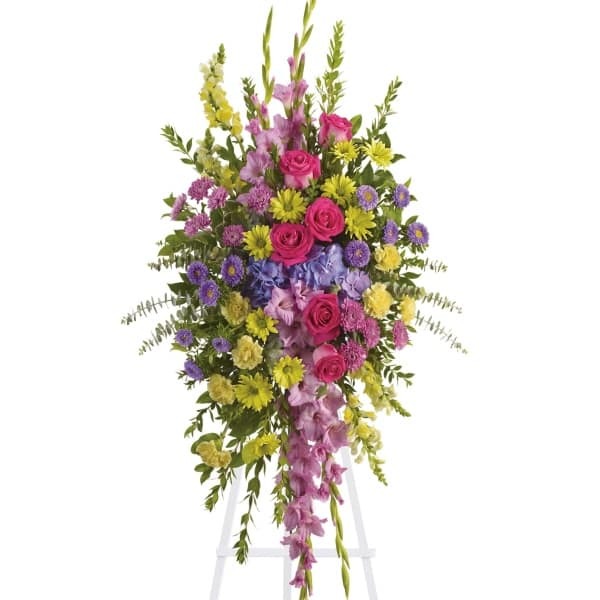 Reflecting the many colors of life, a rich spectrum of blooms evokes the range of emotions experienced in remembering a cherished loved one. This standing spray is a bright and colorful way to show how much you care. 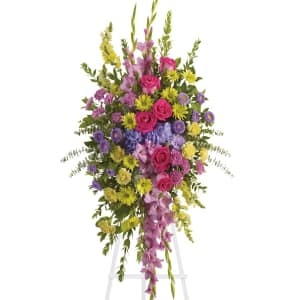 • A lovely assortment of flowers such as lavender gladioli and cushion spray chrysanthemums, yellow snapdragons, carnations and daisy spray chrysanthemums, hot pink roses, purple hydrangea, asters and assorted greens are all presented on an easel. 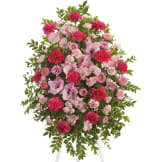 • An appropriate gift of sent from a family member or friend. 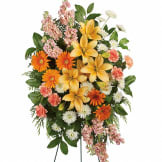 • Arrangement measures approximately 29" W X 55" H.
Flowers will be received by a Stephen J. Priola Parsippany Funeral Service's staff. 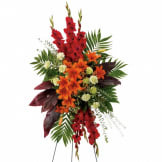 All of our flowers are designed and delivered by hand from a local florist in in Lake Hiawatha.